Lilly was placed with a family by ARG in December 2017. We thought the home would be an excellent place for her, but we were wrong. That doesn’t happen often, but we are committed to our Airedales and their health and happiness and it just wasn’t working out. She came back to us the last week of June and is back with foster mom/trainer Cindy Green in Florence, SC. Lilly is good with other dogs and goes to doggy day care at Woofers in Florence. She loves to wade in the pool and play with other dogs. She is happiest when she’s with her people, though she loves to lie in the sun outside. Lilly needs a calm environment, so probably isn’t suited to children under 10 or so. Lilly can be anxious upon meeting new people, and she can escalate when there is excitement, but with the right environment, she will be your friend for life. We think she will be best suited to an owner who understands that an anxious dog needs structure and firm guidance to feel secure. Her trainer will help you learn how to continue her training to ensure a smooth transition. Lilly is about 75 lbs but should lose 5-10 lbs. Physical and mental stimulation is essential for her. We see no real limiting issue with this girl except She does snore rather loudly. Lilly is really an excellent dog! She might be the girl for you! Prev Newsletter: Oliver saved and Jazzy update. I am not in the region but will pay for transportation costs anything. Our Angie Airedale passed on with Lymphoma and left Tanner pining (see my FB Page Dave Sullivan only one with an Airedale saying grace before dinner or my. We live on the Oregon Coast a wonderful place for dogs for manifold reasons. They have their own Kitchen and prepared foods and the best of care. She will have a wonderful life with Tanner. Our back area is fenced as well and door always open. You can check with our veterinarian too. We have one other very old rescue that is a gentlr giant at 15+ years. Good luck. and Thank you for considering a rescued Airedale. I’m in Inman, SC. I could foster Lilly, or adopt if possible. We live in Oriental nc, have fenced back yard, have time to be with Lilly, have had Airedales before. What’s next? Thank you for your inquiry. Lilly has gone to her foster/potential forever home this weekend. To be considered for adoption, please fill out an application under “Adopt.” We’ll review your application, have a volunteer contact you for an interview, then follow that with a home visit. We look forward to seeing your application. would love to adopt Lily. Missing having an Airedale since Happy died in June. They really wrap themselves around your heart. My family had an Airedale boy when I was in college (am now 67) but neither me nor my sister has ever forgotten Ami. Thank you, Mary, for your comment. That’s why we do what we do! We love them. Oh my goodness, I believe I met Lilly a couple weeks ago in Chamblee. Beautiful sweet dog. 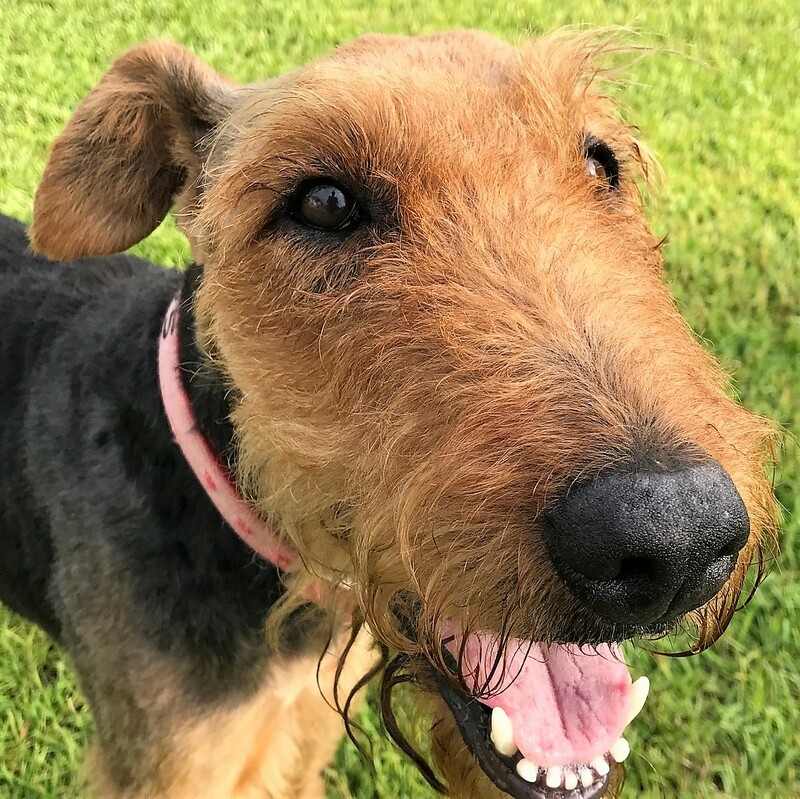 I grew up with Airedales and look forward to adopting in the future and if not for an elderly schnauzer, I’d love to give Lilly a forever home. I was looking at your site to send a message/question but could not find a generic link. Hi, Donna. All of the Airedale groups try to keep their placements within their local areas, but we do occasionally make exceptions. If you would like to fill out an application, we will consider you. We currently have only 1 Airedale looking for a home but believe that she will be placed soon. We never know when the next one will come in, and we do have approved applicants waiting for the right Airedale. It is not a matter of first-come, first-served; rather, we consider the applicants’ requirements and the Airedale’s temperament and history. I wish you success in your search for an Airedale. Hi ARG Folks, I am SO HAPPY to see that Lilly is with a trainer who obviously is taking time with her. This is Debbi Hadaway, who fostered Lilly this past Fall. She TRULY is a WONDERFUL lady who just needed extra handling when playing with other dogs. Even after our mishap, she and Flora got along in the house. She will make a GREAT ‘dale-friend to a very special person. Again, THANK YOU for taking such good care of her. Hi, Lance. We are delighted to hear from you and would love to consider you for Lilly. First, please fill out an application here on our site under “Adopt,” then one of our volunteers will call you to discuss your application. After that, we require a home visit by one of our Airedale-experienced volunteers. Then, when you are approved for adoption, we can consider you for Lilly. I look forward to receiving your application. Thank you! I submitted an application, back on the 8th, just moments before I posted this comment thread. Should I have heard something by now, or should I continue patience? Didn’t want to be sitting around waiting for response if the application didn’t arrive successfully, and no response is in the works. Sorry, Lance, I have been very busy. I’ll call now! Hi Jackie, we’re interested in adopting. We have an application on file, would like to discuss the possibility of adopting Lilly. Jackie- this is gibby again- yes, I would like to talk to you about Lilly!! if you think she is suitable for Jim and me- please call us- thanks!! Hi, Gibby. Did you send this after we spoke this morning?